Senator Elizabeth Warren wants to link social security payments to older people’s living costs. With healthcare and so on, they would rise faster than basic CPI. The Obama administration wants the opposite, but Warren’s idea is fair – even if active workers have to pay for it. 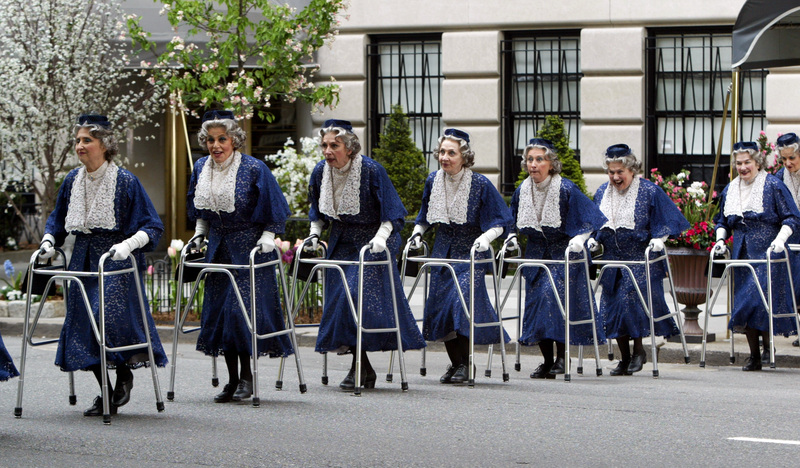 A group of women with walkers cross New York's Fifth Avenue during the filming of a scene for "The Producers" in New York City, May 4, 2005. U.S. Senator Elizabeth Warren, a liberal Democrat, on Nov. 17 proposed that social security payments should be indexed to the experimental consumer price index for elderly Americans. The CPI-E was developed by the Bureau of Labor Statistics to reflect the spending patterns of Americans 62 years of age and older. The CPI-E weights medical care at 11 percent compared to under 7 percent in the more standard CPI for urban consumers, known as CPI-U. The senior-specific measure also gives housing a weighting of 47 percent against 42 percent in the CPI-U. Conversely education, recreation, apparel, food away from home and transportation have lower weightings in the CPI-E. In the 25 years from 1982 to 2007, the CPI-E increased 127 percent (3.3 percent per annum), while the CPI-U rose 115 percent (3.1 percent per annum). In its 2014 budget, the administration of President Barack Obama proposed indexing social security to the so-called chained CPI, in which weightings are adjusted monthly to reflect changes in consumer behavior in response to changes in prices. From December 1999 to September 2013, the chained CPI-U increased by 34.3 percent (2.2 percent per year) and the standard CPI-U rose 39.1 percent (2.4 percent annually).